Acne treatment facials are important and very beneficial to help keep blackheads, breakouts and clogged pores and oily skin at bay, and improve the overall appearance of your complexion. 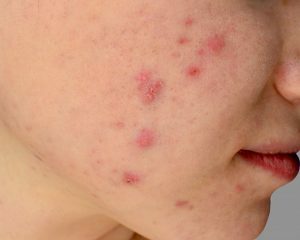 Because acne treatments are no longer just for teenagers, many men and women in their 20’s, 30’s, and 40's are dealing with spots, zits and pimples, blackheads and irritated skin. So when you come in for an acne facial you will need to fill out a standard questionnaire, and we will discuss a good acne treatment or treatment plan for you. I will need to know about your health, and any medications you are using, and what you are allergic to, because some treatments I may want to use might not be the best choice for your acne prone skin. Ladies, you will need to take your top off, but can keep the bra on. Men need to remove the shirt, then you lay down in between cozy sheets and a blanket, and get a head band on, and we will begin your acne facial with deep cleansing the face, neck, and chest. Once the skin is thoroughly cleansed, we continue with exfoliation which helps to clean and shrink your pores, and remove dead skin cells and debris. After that step alone your skin will already feel much softer, cleaner and smoother. Then we do a scrub and a peel and use microdermabrasion for acne scars, but he treatment will be customized and will depend on your skin and the type of medication you are on. Then we do extraction which is nobody's favourite, but it is important. Please be aware that we might not be able to get rid of all blackheads with one acne treatment facial, because, if you have not had a facial treatment before or if you didn't have a facial in a long time, it is not a realistic expectation. And you need to know that only a dermatologist can extract cysts. After the extractions I will apply a healing mask and use an ultrasonic treatment designed to help your skin to absorb the products, and to calm down your skin, and for acne control. Then we need to wait a bit and allow it all to work. Then the mask gets removed and an organic human growth factor stem cell skin care product is applied, and I will finish the facial with a massage. Wearing a broad spectrum mineral sun screen SPF30 every day is very important, even on a cloudy day. If you'd like to make this an even more effective acne treatment you may add on a blue light acne treatment to help heal the acne problem, and acne redness, and work to kill the acne-causing bacteria. How Many Acne Treatment Facials Do I Need? Acne is tough to get rid of but with regular facials, and acne light therapy, and good acne products you will be on your way to much better looking skin. Our Luminesce skin care line is organic and is made with stem cell technology and is one of the best products I have ever come across to help clear up acne and it might take six months or more, but it is well worth it if you want to avoid acne medication. You can opt to do a series of six acne treatment facials at two week intervals, and using the prescribed home care products and staying out of the sun as an intense treatment plan.